A focus during COP23 was to better connect the Ecclesial Network of the Congo Basin Forest (réseau Ecclésial de la forêt du Bassin du Congo or REBAC) with other initiatives and as such, we dedicated the first days to understand the efforts of the Central African Forests Commission (Commission des forêts d’Afrique centrale or COMIFAC) and explore a dialogue. 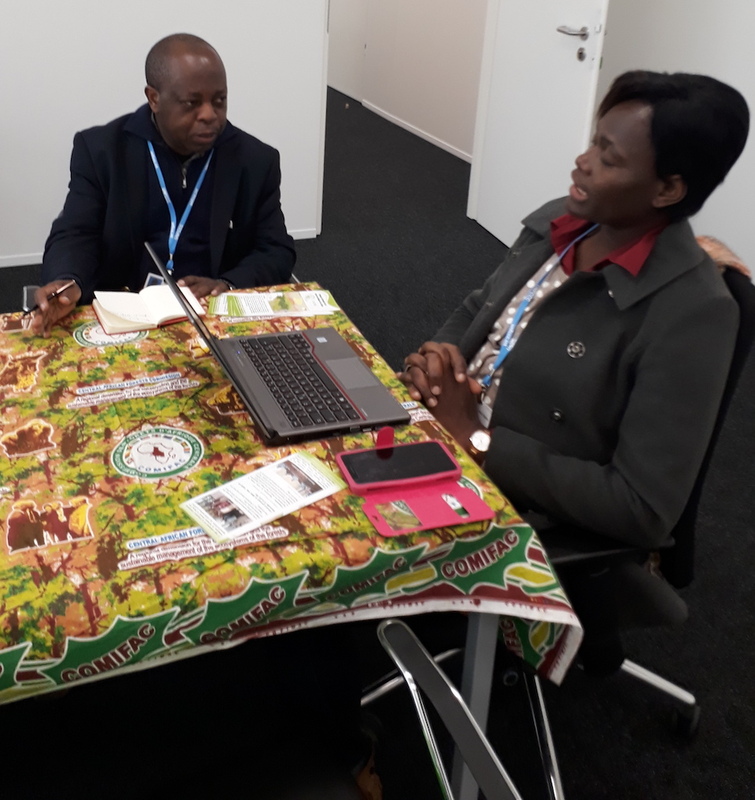 Exploring further collaboration for the Congo Forest Basin in COP23. COMIFAC was then established with a mandate to coordinate the monitoring of activities to implement the Declaration in the region. A COMIFAC Convergence Plan was adopted in 2005 that defines a common regional intervention strategy for the countries of the subregion and their international development partners. During discussions with COMIFAC staff in Bonn, a question was why the REBAC network consisted of only Catholic groups. It was then shared how REBAC came about and where the Catholic networks should be present in discussions on the future of the planet and how the encyclical Laudato Si’ is a response to this call. Rigobert at the COMIFAC exhibit booth in COP23. 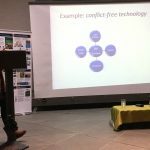 The COMIFAC staff have not heard about Laudato Si’ but found its message on “what kind of world we are leaving to next generations” goes beyond a scientific discussion and involves a moral responsibility and presents an ethical problem. 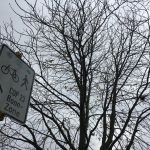 It was also shared that in Laudato Si’, Pope Francis draws attention to the ecosystem and the biodiversity of the Congo Basin region, “…those richly biodiverse lungs of our planet which are the Amazon and the Congo Basins…We know how important these are for the entire earth and for the future of humanity.” (LS 38) The increasing threats to the region such as the rapid deforestation and the permanent disappearance of animal and plant species are alarming and Laudato Si’ reminds us of the alarming impact on the lives of people in the region. The forests of Africa’s Congo Basin, approximately 200 million hectares, are one of the world’s largest primary rainforests, second only to the Amazon. The region’s forests support the livelihoods of some 60 million people. It then matters to focus on this region, especially as deforestation in this region is growing and doubles every five years. 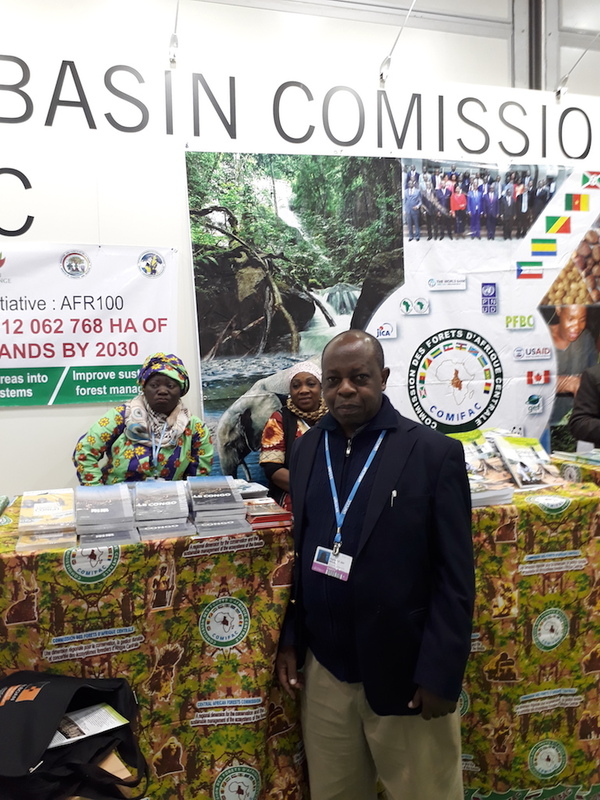 COMIFAC then shared that countries of the Congo basin are learning from the efforts in the Amazonia and has included a forest monitoring system, and allows them draw in international support to protect forests and promote sustainable forest management. COMIFAC expressed their need for development partners that provide transparent and reliable data and information on the forests of the Congo basin to better plan how to support the region. 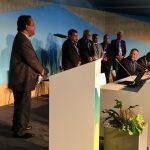 Today all COMIFAC countries are currently implementing forest conservation policies and the national forest monitoring system will allow countries to report their results. There are many initiatives in the region such as the Congo Basin Forest Partnership (CBFP), Network of Protected Areas of Central Africa (Réseau des Aires Protegées d’Afrique Centrale or RAPAC), Réseau Femmes Africaines pour le Développement Durable, Observatory for the Forests of Central Africa (L’Observatoire des Forêts d’Afrique Central or OFAC), Network of Training Institutions and Environmental Forest of Central Africa (RIFFEAC), Conference on Central African Moist Forest Ecosystems (CEFDHAC), and the University Consortium for the Congo Basin Forest Partnership (UCCBFP), among others. REBAC is open to collaborate with COMIFAC and wants to contribute to ensuring that government and international organizations effectively implement policies compatible with the preservation and conservation of the Congo basin ecosystems. An added contribution of REBAC is in helping better connect national and regional policies with activities at the community level because REBAC’s members work in small communities, parishes, dioceses and bishops’ conferences in its six member countries. 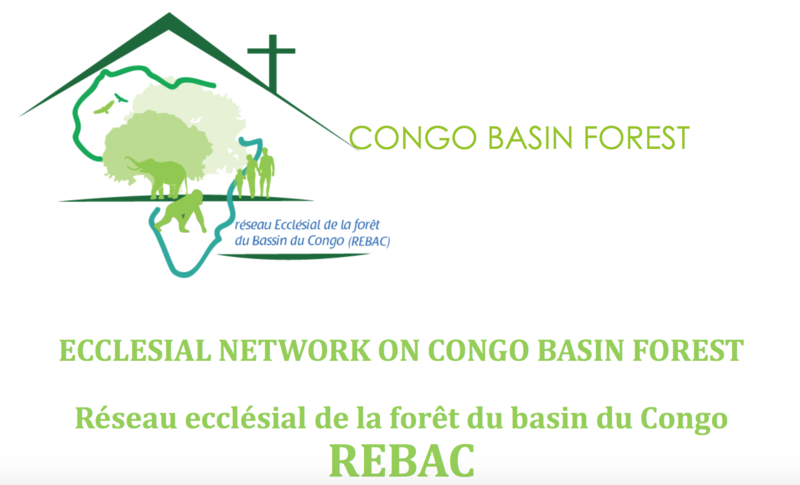 COMIFAC recognizes the need to link with faith-based organizations and REBAC will officially communicate to explore the next steps in this collaboration for the Congo Basin. Rigobert Minani SJ coordinates the JESAM Social Apostolate and is the Director of Jesuits Africa Social Centres Network (JASCNET).